NHM Assam Notification is out. NHM Assam is recruiting for 700 Staff Nurse Govt Job Posts. 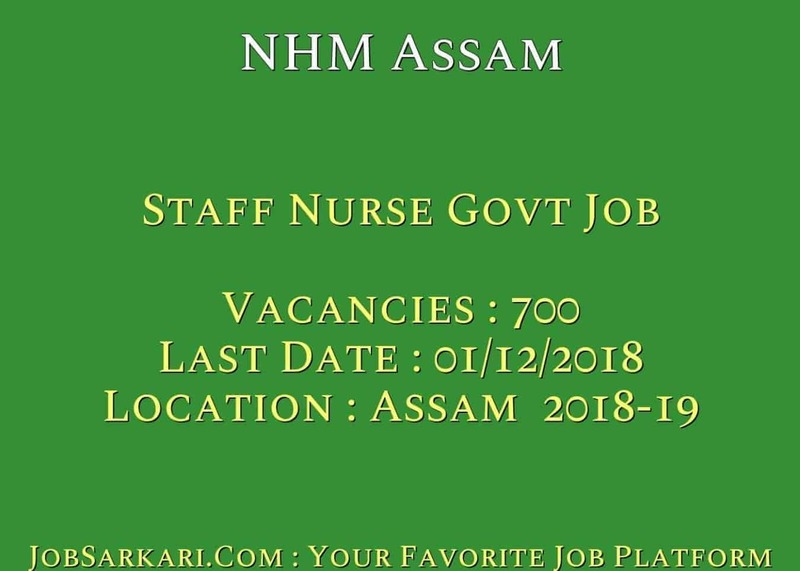 You can check NHM Assam - National Health Misison last date, download NHM Assam notification, visit NHM Assam official website and check other NHM Assam Vacancy details.Complete Vacancy and recruitment Details about 700 Staff Nurse Govt Job vacancies in NHM Assam are provided below by JobSarkari.Com only for you. Staff Nurse Candidate Must Have Passed B. Sc. Nursing/ GNM Course and Registered With Assam Nurses Midwives and Health Visitor Council. Not Specified. 700. 2.Candidate Need to Walk-in-Interview to the Address Given Below. Venue of Interview - State Institute of Health & Family Welfare, Sixmile, Khanapara, Guwahati-22. Date of Interview - 01st December 2018 from 10:00 AM. Q. What is the Last Date For NHM Assam Staff Nurse Govt Job Vacancy ? A. 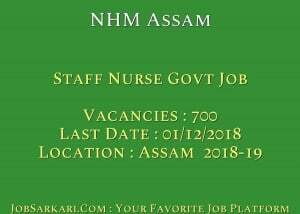 Last Date for NHM Assam Staff Nurse Govt Job Posts is 01/12/2018. Q. What is the Form Type of NHM Assam Staff Nurse Govt Job Recruitment ? A. The Form Type for NHM Assam Staff Nurse Govt Job Posts is Offline. Q. How many vacancies are available in National Health Misison Staff Nurse Govt Job Posts ? A. There are about 700 Vacancies in National Health Misison Staff Nurse Govt Job Posts. Q. What is the Full Form of NHM Assam ? A. Full Form of NHM Assam is National Health Misison .